Today EDF proudly announced its new sustainable seafood partnership with Texas retail giant H-E-B, a cornerstone of communities across Texas for more than 100 years. 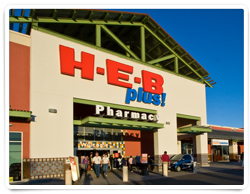 One of the nation’s largest independently owned food retailers with annual sales exceeding $20 billion, they operate more than 350 H-E-B and Central Market stores across the state. Posting a full species inventory online, along with regularly identifying priority seafood items still in need of sustainability improvements. EDF and H-E-B began working together back in 2012 when H-E-B became the first major retailer in the Gulf to offer the GulfWild® brand of red snapper. This innovative sustainability and traceability program was created by Gulf fishermen after the BP Deepwater Horizon disaster in an effort to reassure the public that their fish was safe, responsibly-caught and trackable back to individual fishing vessels. The product can now be found in 150 stores and is evidence of H-E-B’s ongoing commitment to Gulf fishermen and coastal communities. The great news is that, although it may seem like this announcement only affects Texans, H-E-B’s expanded commitment will help ensure more fisheries and fish farms are managed well. That translates into more fresh, sustainable seafood for generations of all Americans to enjoy. This entry was posted in Gulf of Mexico, Seafood and tagged Grouper, H-E-B, Red Snapper, texas. Bookmark the permalink. Both comments and trackbacks are currently closed.